Providing you the best range of maintenance free earthing electrode, mf earthing electrode, hdgi chemo earthing electrode, pipe earthing, chemo" mf earthing electrode and chemo earthing electrode with effective & timely delivery. Earthing is an electrical connection between metallic parts, structures or electric circuits to the ground through buried conductor, i.e. GI, CI or Copper. Generally in any earth system (or earth pit) measures are taken to ensure the good conductivity with low earth resistance. For this purpose water/humidity retaining compounds like salt, charcoal, etc are used in the earth pit with various metallic parts with Salt and charcoal in an earth pit, the life of the metallic parts gets degraded due to corrosion. After lots of concentration & Experience in earthing field we have Design & Developed New Technology based Latest "CHEMO" MF HCC Filled Earthing Electrode is the innovative method of Dual Electrode technology having a compartment of outer shell, inner shell with the terminal on the top, fabricated in high quality ERW material and subsequent galvanization to strengthen the flow / dissipation of fault / static current to its maximum safety, Annular space between Dual Electrodes is filled with a HCC (Highly conductive compound). 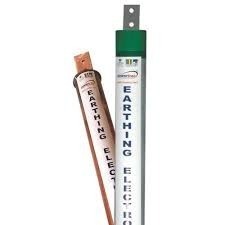 Chemo MF Earthing electrode is designed as per IS 3043:1987 standard (Code of Practice for Earthing) with following features and benefits. Non corrosive, absorbing & retaining the moisture and reduces the soil resistivity. Faster dissipation of fault current, least fluctuation of ohmic value and it eliminates the use of Salt, Charcoal. 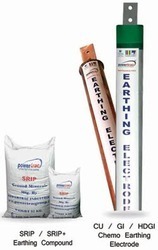 With the help of experienced professionals, we are engaged in offering HDGI Chemo Earthing Electrode. Manufactured using quality tested raw material, our entire range is designed in compliance with industry laid norms and guidelines. These electrodes are widely used in chemical and environmental industries. Owing to excellent features such as low maintenance, high durability and anti-corrosive natures, our entire range is demanded by our valuable clients. Before the end dispatch, our entire range is strigently checked to ensure the quality of products. With our expertise in this domain, we our able to offer a superior quality Chemo" MF Earthing Electrode. These products are fabricated using high-grade ERW/MS material and hot dip galvanization process in compliance with international quality. All our products are widely demanded in the market for its various features such as good conductivity, low earth resistance, and anti-corrosive coating of metals. 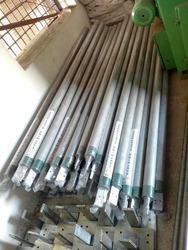 Further, these electrodes are used in making of grid, mesh, tri-pod, faraday/octopus, crow-bar earthing etc. Our customers can avail these products from us at an affordable prices. Earthing is an electrical connection between metallic parts, structures or electric circuits to the ground through buried conductor, i.e. GI, Cl or Copper. Generally in any earth system (or earth pit) measures are taken to ensure the good conducfivity with low earth resistance. For this purpose water/humidity retaining compounds like salt, charcoal, etc are used in the earth pit with various metallic parts with Salt and charcoal in an earth pit, the life of the metallic parts gets degraded due to corrosion. PT-803 80 3000 Transformer, Generator, Lightening Arrestor etc.